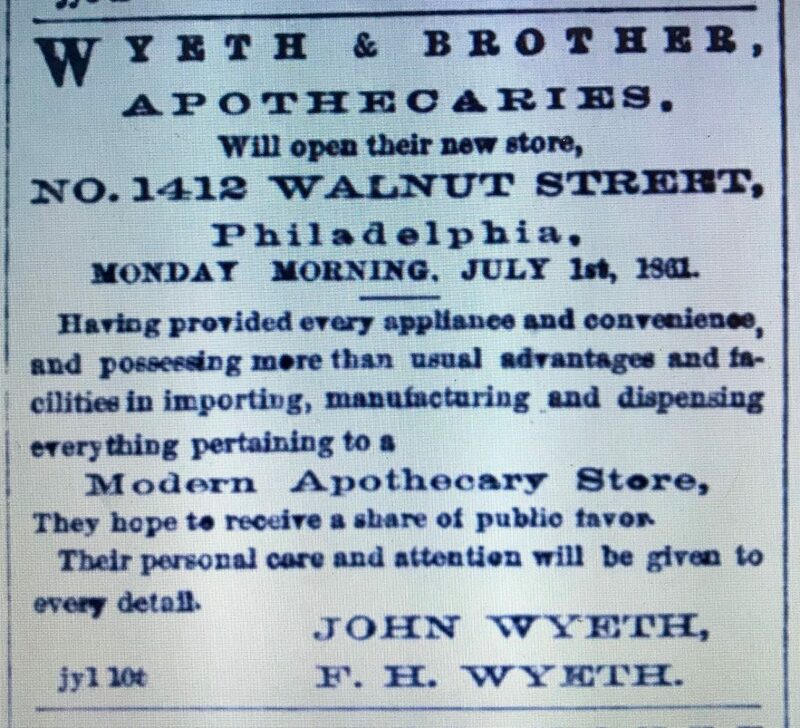 The business of John Wyeth & Brother originated in 1861 when John and Frank Wyeth formed a partnership and opened an apothecary store in Philadelphia. The company and its several successors have remained in business for over 150 years, ultimately becoming a wholly owned subsidiary of Pfizer in 2009. 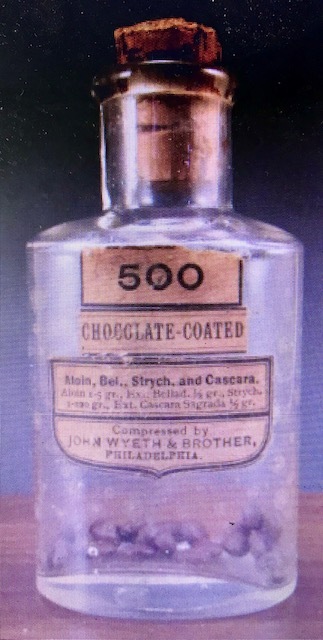 A graduate of the Philadelphia School of Pharmacy, prior to founding John Wyeth & Brother, John Wyeth had partnered with Henry C. Blair under the name of Blair & Wyeth, in a Philadelphia pharmacy business located at Eighth and Walnut Streets. His brother Frank Wyeth, also a Philadelphia School of Pharmacy graduate, worked for the business as chief clerk. On July 1, 1861 the Blair & Wyeth partnership was dissolved and the brothers formed a new partnership under the name John Wyeth & Brother. Notices for both the dissolution of the old business and establishment of the new business were printed in the July 2, 1861 edition of the Philadelphia Inquirer. This change must have been in the works for a while because on July 1, 1861, the same day the above notices were dated, the brothers opened their own store and laboratory at 1412 Walnut Street. A feature on the company, printed in the January 16, 1908 issue of “The Pharmaceutical Era” picks up the story from there. From the beginning the business proved successful, and requiring greater facilities the adjoining property 1414 Walnut Street was added. Their preparations soon became recognized by the medical profession and their laboratory was enlarged by the addition of another property, No. 1416 Walnut Street, the firm soon thereafter entering regularly into the wholesale manufacturing business. When the Civil War broke out he secured a big contract to furnish the Government with medicinal supplies, and from this began the manufacturing of pharmaceutical articles. The elixirs are drug compounds, made up in an elegant and palatable shape; drugs which are nauseating in the ordinary form are in this guise cordials which a patient can take with relish and which the weakest and most sensitive stomach will not reject. 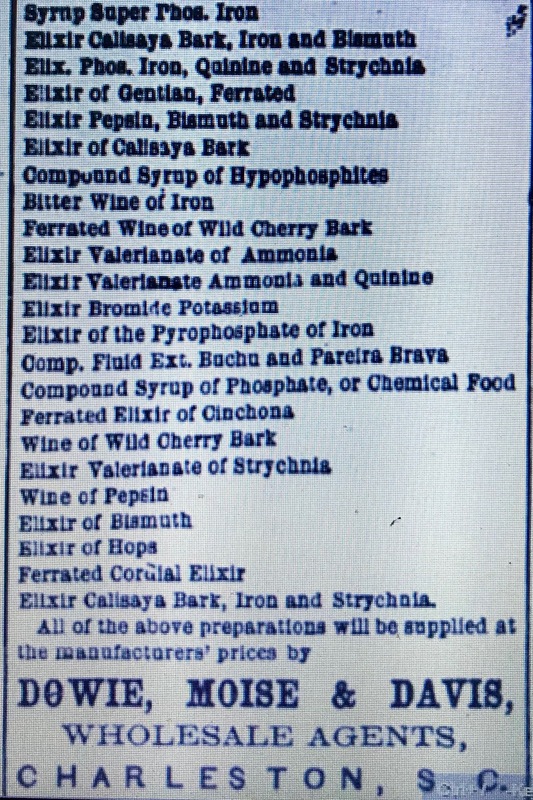 This 1872 advertisement, printed in the Charleston (S. C.) Daily News listed a menu of over 35 elixirs that they were manufacturing at that time. They were also pioneers in the manufacture of medicines in pill and tablet form and in 1872 developed a rotary tablet machine that allowed the mass production of pills with pre-measured doses. Excerpts from a letter written years later discussed in the company’s own words their early history in this field. Dated January, 1913, it was written to the U. S. Department of Agriculture Bureau of Chemistry in response to a request for information on tablet compressing machines and printed in the Journal of the American Pharmaceutical Association. We have no prepared data or printed matter on hand of tablet compressing machines; from our books we glean that in about 1872 we constructed the first rotary tablet machine in our own shop by our chief mechanic; the machine was what is styled a disc machine with several dies, and improvements were constantly added and machine perfected until we had some machines that had as many as thirteen dies in rotating disc and some of these machines are still in use at the present time in our laboratory. Throughout the 1870’s the business was growing and by 1879 that growth had reached Canada where the Montreal firm of Perry Davis & Son & Lawrence was serving as their agent. Interestingly they didn’t ship their products to Canada but instead, according to a March 28, 1881 story in the Montreal Gazette, shipped their chemists to Canada instead. Nearly every preparation included in the Pharmacopia is manufactured under the direction of this firm (Wyeth) in the establishment of Messrs. Perry Davis & Son & Lawrence. The method in which it is done is this: Messrs. Wyeth & Bro. send on their representative from Philadelphia at certain periods of the year and a large number of hands are engaged. The manufacture is proceeded with on a large scale and as soon as the stock is regarded as sufficient for the time being for the Canadian market operations cease. When the stock runs low again the manufacture is renewed. 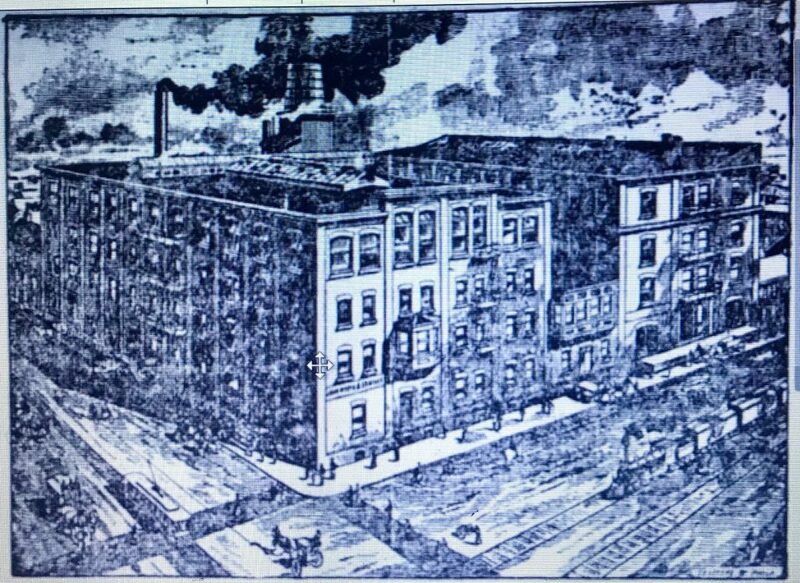 In Philadelphia they remained at the Walnut Street location until 1889 when their entire plant was destroyed by fire. The fire was described in the March 6, 1889 issue of “Chemist & Druggist,” and a diagram of the fire was included in the next day’s Philadelphia Inquirer. 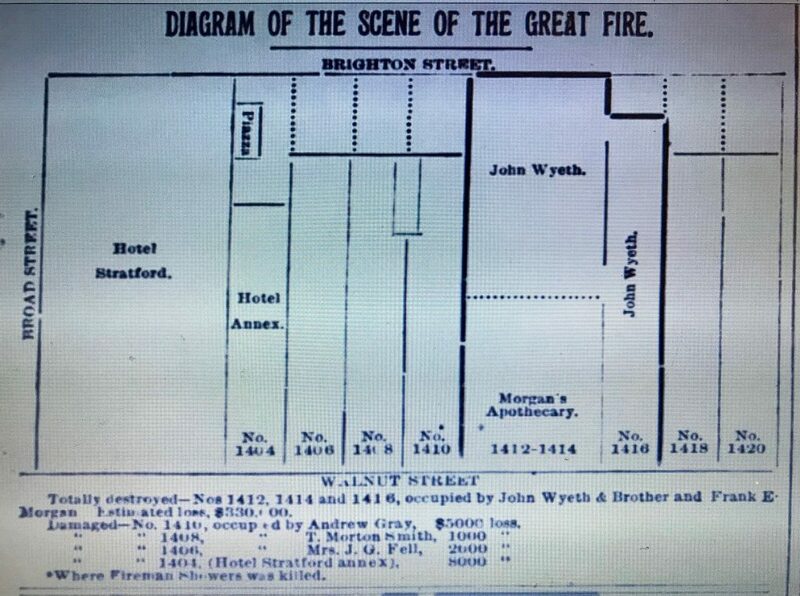 It brief we may state the fire originated just before noon on February 10 in the cellar of Frank Morgan’s drug store, which was part of the main building, a handsome marble structure, occupied by John Wyeth & Brothers. The fire raged fiercely. Great plate glass windows cracked as if they had been egg-shells. In a few minutes the gable roof of John Wyeth & Brothers’ store was on fire. The flames crept stealthily back and joined the blaze on the roof of the marble front. The roof fell killing a fireman in its descent and when darkness came a mass of ruins marked the spot where a few hours before stood one of the handsomest drug stores in the country. Great sympathy is felt for Messrs. Wyeth Brothers who commenced business in Walnut Street twenty five years ago, and during that time have made a significant collection of apparatus, especially that for making compressed tablets, the loss of which cannot be represented by money. John Wyeth & Brother have purchased the property at the southeast corner of Eleventh Street and Washington Avenue where they will establish their chemical laboratory. Six weeks later on August 1, 1899, another Philadelphia Inquirer story announced planned alterations to the building. Builder McPherson will erect a number of new buildings. Among them can be mentioned the extensive alterations to be made to the building of John Wyeth & Bro., at Eleventh and Washington Avenue. A new fourth story is to be added and extensive interior alterations made, which will cost at least $20,000. The January 16, 1908 feature on Wyeth in the “Pharmaceutical Era” noted that they moved into their Washington Avenue location in November that year. What appears to be a rendering of the original Washington Avenue building, including the new fourth floor addition, was incorporated into a Wyeth advertisement printed in the October 22, 1899 issue of the Philadelphia Inquirer. The Pharmaceutical Era feature went on to say that subsequent additions made over the next ten years tripled the capacity of the original plant. Additions and innovations to their product lines continued as well; one example being an entire line of “chocolate coated” compressed tablets introduced in 1901. We trust the introduction of a line of Chocolate-coated Compressed Tablets (Compressed Pills) will meet with the same favor that has been accorded to our Plain and Sugar-coated Compressed Pills, and which we do not hesitate to claim as one of the greatest advances in pharmacy of the age and a distinct innovation in the manufacture of pills. As no excepient enters into their composition, they do not become hard by age and are less liable to be affected by any climatic influences. Their lenticular shape renders them much easier to swallow than the ordinary round pills. In fact, they offer so many decided advantages they must commend themselves to every practitioner. The business incorporated on October 27, 1899 under the name John Wyeth & Brother, Inc. 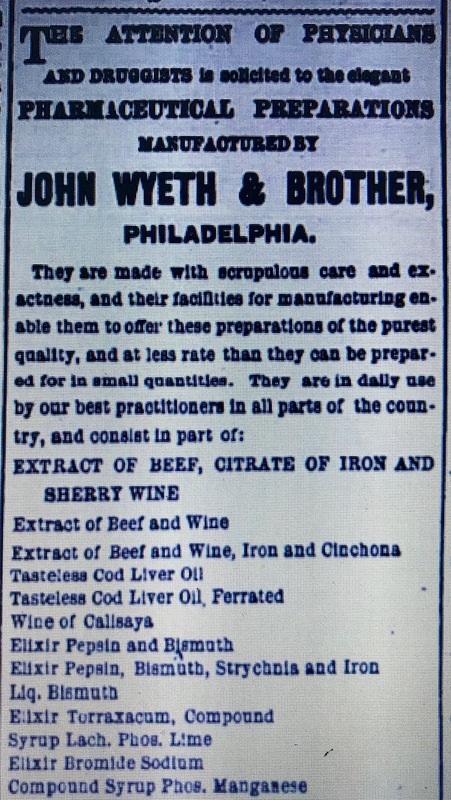 The incorporation notice printed in the October 28, 1899 edition of the Philadelphia Inquirer named John and Francis H. Wyeth along with E.T. Dobbins, W.A. Sailor and H.G. Starin as the initial directors. John Wyeth served as president until his death on March 30, 1907 when he was succeeded as president by his son Stuart Wyeth. A year later in 1908 his brother Frank retired as Vice-President and was succeeded by his son Maxwell Wyeth. The business remained in the Wyeth family until Stuart Wyeth’s death on December 30, 1929. A bachelor, he left the bulk of his estate, approximately $5,000,000, to Harvard University which at the time was the largest sum ever left to Harvard. A story in the May 28, 1931 edition of the Boston Globe summarized the ownership in the Wyeth business after the dust settled. In early 1930 45 to 50 percent of the Wyeth stock was willed to Harvard University by Stuart Wyeth. Other than 5 percent owned by employees of the company, the balance rests with two Philadelphia institutions, serving as trustees, the Fidelity-Philadelphia Trust Company and Pennsylvania Company for Insurance on Lives and Granting Annuities. Purchase by American home Products corporation, of John Wyeth and Brother of Philadelphia for about $4,000,000 in cash, will increase the per share earnings of American Home Products approximately $1…The transaction approved by the directors in May will be financed out of current funds and with bank accommodation. Still headquartered in Philadelphia, at the time the business was sold it had become nation-wide and had also established their own laboratory in Canada. A story in the December 19, 1933 edition of the The Wilkes-Barre (Pa.) Record provided a snapshot of the business just after the sale. It employs 600 workers in its manufacturing plants and offices and it has 100 traveling salesmen covering Canada, the United States and the outlying territories. As a subsidiary of American Home Products, the business continued under the name John Wyeth & Brother up until 1943. During this period, long time Wyeth employee Frank F. Law served as vice president and general manager and later president of the company. Then in 1943 American Home Products reorganized the drug piece of their business under the name Wyeth, Inc. A September 30, 1948 story in the Wilkes-Barre Record that featured Frank Law touched on the 1943 reorganization. In 1943 American Home Products merged five companies into an ethical drug division, using Wyeth as the nucleus and with Harry S. Howard, then head of AHP as president. The new firm was called Wyeth Incorporated and Law became vice president in charge of pharmaceuticals and penicillin manufacture and president of John Wyeth & Brother Incorporated of Canada. Wyeth was among the first to grasp the revolutionary potentialities of penicillin and under Law’s direction the company was a leader in the manufacture of the new wonder drug. 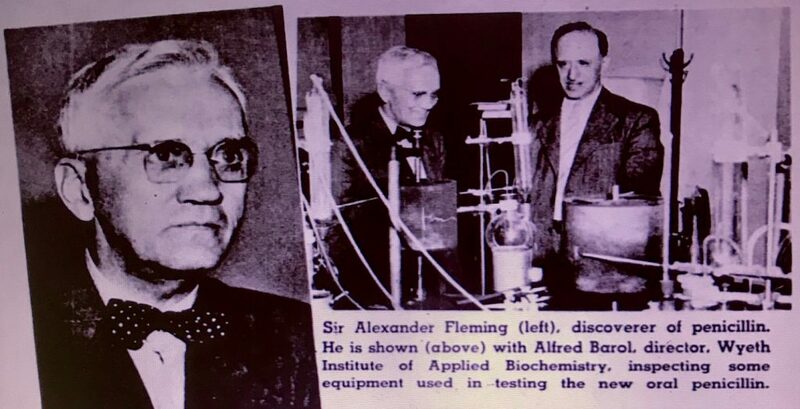 This photograph, printed in the August 5, 1945 edition of the Philadelphia Inquirer actually shows the nobel prize winning discoverer of penicillin, Sir Alexander Fleming at a Wyeth laboratory. The Marietta plant of Wyeth Laboratories, Inc. has been kept quite busy the past few days as a result of an increased demand from New York City for small pox vaccine to combat an outbreak in that city. Dr. John H. Brown, production director at the laboratories, reported that over 100 members of his staff were very busy processing and packing small pox vaccine in order to fill New York City’s request for 2,000,000 inoculations. Wyeth Laboratories’ new $8,000,000 pharmaceutical facility near Malvern which will replace its 12th St. and Washington Ave. plant here, will be ready for occupancy in six months, it was announced Wednesday by Herbert W. Blades, president. The new structure located on a 90 acre tract in East Whiteland township, just off Route 30, will have more than 12 acres under roof. The building cost $2,500,000 and manufacturing and laboratory facilities will cost an estimated $5,500,000. Some 750 persons, including scientific, technical and administrative workers, will be employed at the plant. The facility will turn out prescription drugs and also serve as a national warehouse for Wyeth. According to another article written around the same time, by then the company was headquartered in Randor Pennsylvania and had 21 manufacturing and distributing centers throughout the country. We are changing our name to reflect an important transition in the company’s history. Over the years we have strategically evolved from a holding company with diversified businesses to a world leader in research based pharmaceutical products. The Wyeth name, with its long and well respected association with the health care community, better conveys the skills of our people, the promise of our science, the quality of our products and our position as a world leader in the pharmaceutical industry. In 2009 Pfizer acquired Wyeth in a $68 billion deal. John Wyeth & Bro., Philadelphia have opened a New York office at 449 West 42nd Street, with Charles Howard as their representative. Over the next 40 years they maintained an office and most likely warehouse facilities at a number of NYC locations. Specific listings I can find include: 12 East 22nd St. (1919 to 1922), 7th Ave & 10th St. (1925), 117 7th Ave. South (1933) and 154 11th Avenue (1942 to 1946). In 1948 it appears that much of their New York operation moved to 34 Exchange Place in Jersey City, N.J., however, they did continue to list a New York office until at least 1960. That year they were located in the Empire State Building. 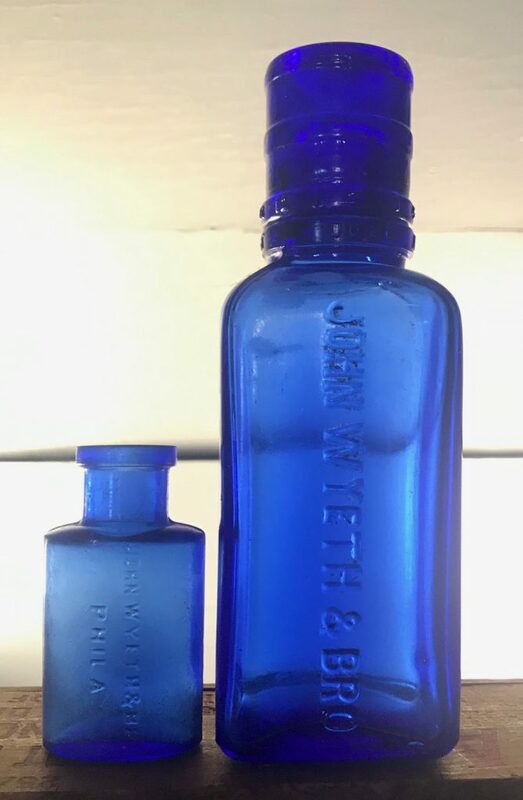 I’ve found two Wyeth bottles over the years, both cobalt blue. One is a small mouth blown oval shaped pill bottle. The other is a square machine made bottle with a timed dosage cap that fits over the top (the bottle and cap were found in different locations at different times.) According to embossing on the base of the bottle it was patented on May 16, 1899. A recent labeled example exhibited on the Internet contained sodium phosphate; “A mild and pleasant Laxative Employed in the Treatment of Constipation, Obesity, Children’s Diarrhea, Rickets, Jaundice, etc.